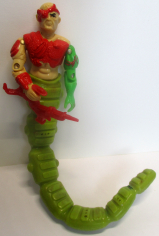 Notes: Sunbow's Golobulus was similar to the toy's design on top, but his tail was grey and more naturally serpentine, and he had no red veins on his green arm. Until the end of the Movie, he was concealed in a huge, floating green pod. Actor Burgess Meredith had a major role in the 1945 film The Story of G.I. 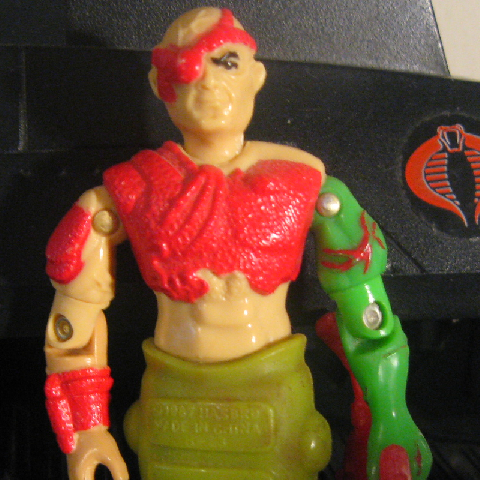 Joe, which inspired the name of the toy line. Accessories: red underslung bio-laser rifle with arm clip (new). Descended from the serpent kings of pre-history, Golobulus rules over Cobra-La, a hidden, secret valley in the Himalayas where the high priests of the Bio-Mechanical cult have created a technology based solely on living organisms. The buildings of Cobra-La are really colonies of crustaceans, and the clothes of inhabitants are as alive as the people who wear them. Golobulus has achieved immortality through symbiosis...at the cost of his humanity. "The plates of Golobulus' body armor are living mutations of lobsters and crabs, each genetically altered to perform a specific function and bred for the tensile strength of their chitonous shells. Over the centuries, so much of Golobulus' body parts have been replaced or bio-mechanically altered that very little of the original is left except for his brain and his central nervous system." Toy Notes: Carded in a three-pack with Nemesis Enforcer and Red Dog. Item #6141. The prototype shown in the 1987 insert catalog had various mold differences, a silver gun, and a grey tail that coiled, allowing the figure to stand unattended.